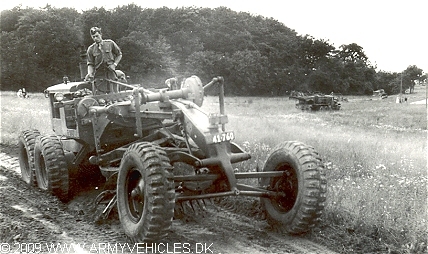 Danish Army Specific: The Danish Caterpillar D12 motor graders were acquired around 1954/55. The D12 was a civil grader, which was militarised by the army after deliverance through W. Langreuters Eftf. in Copenhagen. The standard front wheels (9.00 x 24) were changed to the same size as the 4 rear wheels. Other modifications included front and rear lights, attachments for licence plates, fire extinguishers etc. Approximately 10 machines were purchased and distributed to the 2 engineer regiments. Length: 7.75 m (302 inches). Width: 2.47 m (96 inches). Height: 2.80 m (with muffler (109 inches)). Weight: 11.275 kg (24.805 lb.). Engine: Own 6-cylinder, type D-318, 8.600 cm3 (524 cubic inches), water-cooled. Horsepower: 100 at 1.800 rpm. Fuel capacity: 230 liter (50 gallons). Additional: Starting system was a 2-cylinder gasoline boxer engine, also providing preheating of intake air for easy start of diesel engine.